This festive cheese spread is simple to make and absolutely addictive. It has been a popular and consistent guest at our Christmas celebrations for many years. If you are so inclined you can garnish with chopped fresh herbs, but I never do. Serve with Carr’s or your favorite neutral cracker, or on baguette – fresh or toasted. Grapes are a delicious accompaniment. If you have any spread left you can even top a freshly-cooked steak and it will melt into a deliciously decadent sauce. Below I give directions for two versions. The first is made by hand and yields a lovely spread with chunks of Stilton throughout. 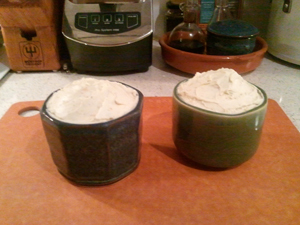 The second is made in the food processor and yields a very smooth, homogenized spread. I like the handmade one with some texture. Place the cream cheese and the butter in a large bowl and allow to come to room temperature. 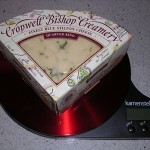 Place the Stilton in a shallow dish or glass pie plate and use a sharp knife to cut it into pieces about 1/2-inch square. When all ingredients have softened and come to room temperature, mash the cream cheese and butter together with a fork until well blended. Add the Stilton and mash it into the blended mixture leaving some lumps for texture and taste. Scoop into attractive serving dishes, such as pottery ramekins. Cover tightly with plastic wrap and chill at least 24 hours to ripen. 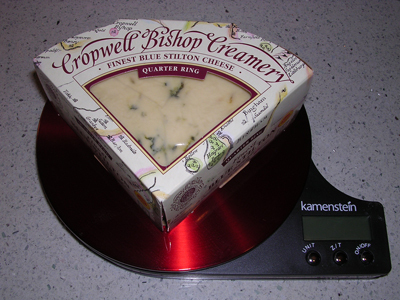 Cut the cream cheese into chunks, place in the processor workbowl and pulse-chop until smooth. Cut the butter into chunks and add to the cream cheese; pulse-chop until smooth. Cut the Stilton into chunks and add to the workbowl. Pulse-chop and then process until smooth.